IFA 2017: SanDisk's 400GB Ultra microSDXC UHS-I is the world's highest-capacity microSD card. SanDisk today announced its 400GB Ultra microSDXC UHS-I card, the world's highest-capacity microSD card for use in mobile devices. Two years after introducing its record-breaking 200GB SanDisk Ultra microSDXC card, SanDisk has doubled the capacity within the same tiny form factor. SanDisk achieved this capacity breakthrough by leveraging its proprietary memory technology and design and production processes that allow for more bits per die. Ideal for Android smartphone and tablet users, the world’s highest-capacity card can hold up to 40 hours of Full HD video and features superfast transfer speeds of up to 100MB/s to deliver premium performance. At this transfer speed, consumers can expect to move up to 1,200 photos per minute. Additionally, the 400GB SanDisk Ultra microSD card meets the A1 App Performance Class specification, which means that the card can load apps faster. Through the updated SanDisk Memory Zone app, users will have even greater control over their mobile device's memory storage. The app, available for free download from the Google Play store, is compatible with most Android-powered devices and allows users to easily locate, organize, transfer and back up data, including tagged content from Facebook and Instagram. 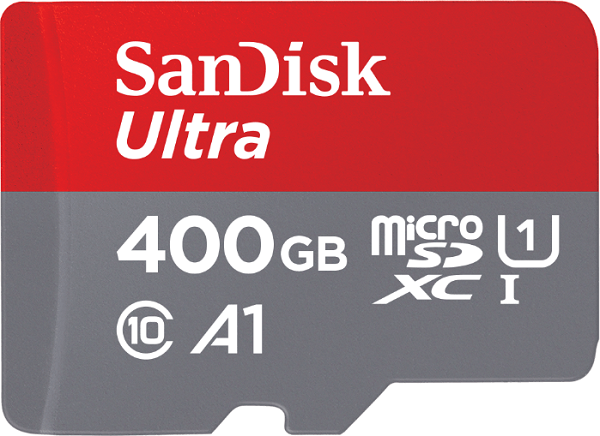 The ground-breaking 400GB SanDisk Ultra microSDXC UHS-I card features a ten-year limited warranty and will be available at SanDisk.com and other major retailers at a U.S. manufacturer's suggested retail price (MSRP) of $249.99.